Summary: Up–Macy, 16, witnessed her father's death, but has never figured out how to mourn. Instead, she stays in control–good grades, perfect boyfriend, always neat and tidy–and tries to fake her way to normal. Then she gets a job at Wish Catering. It is run by pregnant, forgetful Delia and staffed by her nephews, Bert and Wes, and her neighbors Kristy and Monica. "Wish" was named for Delia's late sister, the boys' mother. Working and eventually hanging out with her new friends, Macy sees what it's like to live an unprescripted lifestyle, from dealing with kitchen fires to sneaking out at night, and slowly realizes it's not so bad to be human. Wes and Macy play an ongoing game of Truth and share everything from gross-outs to what it feels like to watch someone you love die. They fall in love by talking, and the author sculpts them to full dimension this way. All of Dessen's characters, from Macy, who narrates to the bone, to Kristy, whose every word has life and attitude, to Monica, who says almost nothing but oozes nuance, are fully and beautifully drawn. 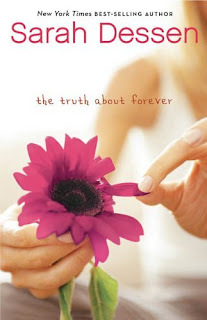 My Thoughts: Oh how I love thee Sarah Dessen! My first book was Lock and Key! This is my second book I've read by her! I love her writing story and I seem to like the characters alot. We get to know Macy, who thinks she HAS to be perfect but really she does not want to be perfect. She feels guilty about her father passing away. I won't give too many details about that as its told very slowly in the book. But, we get to know her feelings and I felt myself relate to almost everything she felt. I also lost my dad, when I was 13 so I could understand Macy's pain. Macy's boyfriend thinks it would be best if they took a break over the summer while he goes and does his own thing. Except he wants her to take over his old job! She also starts working For Wish Catering and we get to know all the people who work there! Well, she than meets Wes. By the way, this guy is totally swooooonnn worthy! I fell in love with him over the course of the book and now I wish he was real! Are you real out there somewhere Wes? To sum it up, if you haven't read any of Sarah Dessen books, start off with this one, its a good romantic fun read! Overall: Love Love Love Love this book! Cover: Its pretty! And, the way she is pulling the petals off the flower, totally romantic wouldn't you say? I think that this book has to be my fave book by her :) I loved it too! I did start off with this one and LOVED it. You're so right - Wes is totally swoon worthy! I have a copy of this one. I started reading it at a friends house one morning after I woke up. Everyone else was still asleep and I didn't have my own book with me. Needless to say I read a 100 pages before anyone even woke up! I had to get my own copy..lol..still have yet to finish it. I'll have to get back to it. I really was enjoying it! I love this book too!! I love Sarah Dessen! Her books are so much fun to read!